After celebrating its 20th anniversary, O.A.R. is ready to begin another era this year with the release of a new album, tentatively titled The Mighty. 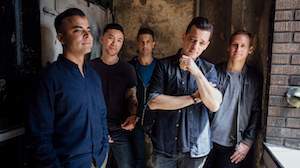 O.A.R kicked off 2018 with the release of a new single “Just Like Paradise” and the announcement of a national summer tour that will take them back to Stir Cove once again. “It’s a song about new beginnings,” frontman Marc Roberge explained to Billboard earlier this year, “all about everyone talking about how we need summer to show up a little bit earlier this year, how we need a fresh start. That’s what the song represents, a brand new outlook to the day, a brand new start.”The Rockville, Maryland band consisting of lead vocalist/guitarist Marc Roberge, drummer Chris Culos, guitarist Richard On, bassist Benj Gershman and saxophonist/guitarist Jerry DePizzo have sold close to 2 million albums and more than 2 million concert tickets, including sold out at shows at storied venues across the country – including New York City’s Madison Square Garden and Red Rocks Amphitheater in Denver. They have been a mainstay on the summer tour circuit for the last decade and have impressed fans across the globe with their live performances.